I am a regular shopper at Whole Foods Market, and the Whole Body section is where I buy many of my high-quality clean beauty products. When I moved to Annapolis, MD I was grateful to be within a 5-mile radius of Whole Foods, because I can rely on most of the brands there to meet my high beauty standards for both my personal beauty stash and my professional kit. When Whole Foods contacted me about their Whole Body sale happening on October 6th-8th and wanted to send me some products to try and promote I said, "Definitely as long as they fit my ingredient standards." My husband said, It's about time Whole Foods starts giving back to YOU. ha!" I was pleasantly surprised to see that some of my favorite clean beauty brands were included in the package that Whole Foods sent me. This blog post will focus on my top three favorite brands, Dr. Hauschka, Seaweed Bath Co. and evenhealy. I'll also add a product spotlight for each brand. Dr. Hauschka was one of the first luxury clean beauty brands that I ever used, and it has been a Whole Body staple as long as I can remember. The company has a passion for natural medicine, healthy skin, and rhythms of nature-- the perfect recipe for a clean, luxury skincare brand. 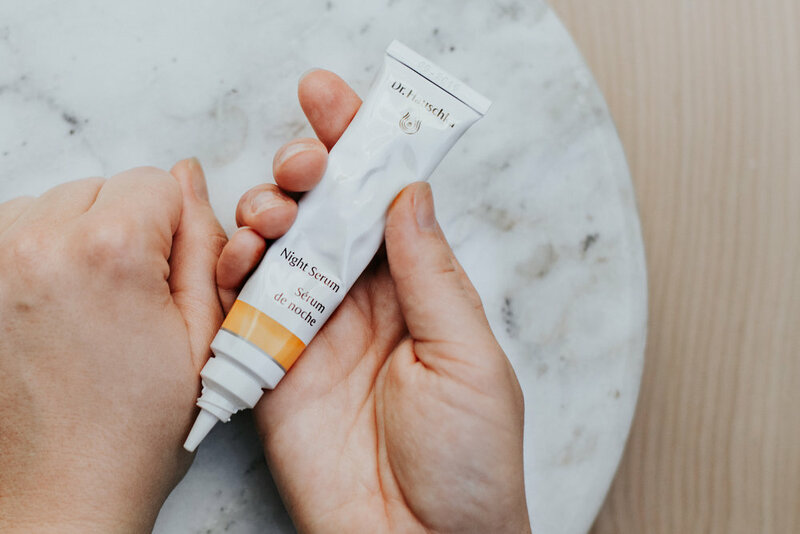 I'm in awe with the texture of the Dr. Hauschka Night Serum, because it's smooth and soaks into my skin without feeling like I have a thick layer of product on my skin's surface. The apple notes in the ingredients are reminiscent to a gentle fruit acid peel, but without the tingling feeling you get with a peel and the dryness after. This serum is gentle and supports your skin's natural renewal — just right for reactive skin like mine. Seaweed Bath Co. where have you been all my life?! The company has been around since 2010, but I found them a couple years ago in the Whole Body section of Whole Foods while browsing their Restoring Line. When Whole Foods sent me their Purifying Detox Body Wash, I was in straight up seaweed heaven. The ingredients are clean, and the scent of Rosemary and Mint are so invigorating in the morning and I need that after long nights with a one-year-old. I've been an avid evanhealy fan for a few years now. The entire line is based on truth, and each product is thoughtfully crafted. If you are client of mine, I have probably recommended you buy evanhealy's Wild Carrot Nourishing Eye Balm. This balm is the gentlest and most effective, clean eye balm on the market. Do you have dryness on or around your eyes? This product will cure your dry lids and soften your fine lines. I use it on my eye lids every night before bed and then swoop the balm on the fine lines in my outer corners — where crow's feet start to appear. The product is so easy to apply, because it comes in a twist up tube (like a chapstick for your eyes). No messy fingers and simple, soft application. I cannot recommend this product enough! Good news... you can shop all my favorite clean brands mentioned above at your local Whole Foods. More good news... You can pre-order the Whole Body 25% off sale to get the products you want without worrying if they will be sold out. All you have to do is ask a sales clerk at your local Whole Foods before October 6th. The in-store Whole Body sale is from October 6th-8th.